"The RX-596 provides 80 watts per channel with low distortion. It delivers enough power to comfortably handle the requirements of most rooms and most speakers. 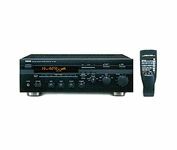 The versatile RX-596 receiver can handle up to four independent audio program sources, such as CD or cassette deck, and additional two A/V sources, such as VCR, laser disc, or DVD player. With Pure Direct Switching you can bypass the tone, loudness, and balance controls, routing the signal directly to Yamaha's discrete power amplifiers to provide the purest signal possible. The RX-596 incorporates a separate amplifier solely for the CD input. It bypasses the tone, loudness, input selector and balance controls and assures a pure power path.Logical and symmetrical circuit and component layout ensures the strongest signal and the least interference. Yamaha's ToP-ART base is constructed of composite material designed to dampen vibration and other resonances. It is filled with proprietary materials to further reduce any residual effects. " Great sounding, very well made stereo receiver. You can find clean used ones for under $75. Yamaha receivers from this era are sleepers: audiophile quality that can be had for a song. Also be on the lookout for the RX-777, the top-of-the-line from this era. Input selector switches can get noisy and need cleaning. Also, the fluorescent displays dim with time, but Sears is actually still selling the replacement part (VQ915100)!